Many of you may know that I am a big believer in finding a bargain. Especially if it is a copy of something that I have wanted for a while! Now when I was younger and lived in Hertfordshire and Essex areas, we used to go to this amazing market (unfortunately not for vintage etc items) but instead for little bargains of accessories or 'cabbage' items - which are were a company over produces items and then sells them to wholesalers who sell them on to markets at a fraction of the pricee in order to make a profit on them. This market is called 'North Weald Market' and every time I go there I search out for the Topshop stall. Over the years I have got some amazing items that were actually in store at the time and I would be buying the items for less than i would be paying even with my Topshop discount when I worked there! Now as I'm not at Topshop anymore, it is really nice to find something you like every so often and treat yourself! The dress below is currently in the Topshop sale in store and I got it here for £12.50, which I was really happy with! I wore it out for a night with some friends and I matched it with my favourite wedges, a black belt and my obsessed necklace at the moment, I especially love the puffy sleeves in a thinner material! What do you think? Do you agree with buying copies for items that you can buy for half the price? The gorgeous personalised gift company 'Bags of Love' have decided to join with Clashing Time by holding a link up under the 'My Links' section to the left hand side of my blog. The company kindly offered a present for doing so and this is what I ordered. 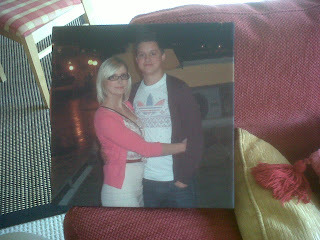 Sorry about the terrible phone image, but this is a small canvas to go on my wall in my bedroom of myself and my boyfriend on holiday in January. It really is the perfect size and its so clearly printed considering its on a canvas! If you want to have a look then please do, they do lots of other gorgeous little gifts, and as its my friends birthday coming up, I am going to get one similar to this sent to her! I'm guilty of this! In my latest post I wrote about how I bought an Accessorize bracelet at a market in Spain for a fraction of the price, and today I checked the website and it's still being sold! I love this- it is gorgeous, & the necklace is a beaut too! This dress is gorgeous! Love the simple necklace and belt, you look lovely! I'd definitely hunt out a Topshop bargain, that stall sounds great to me! That dress looks gorgeous on you! I only ever shop in Topshop when things are reduced, I refuse to pay full price. gorgeous necklace and dress the colour really suits you and you look so pretty as always! Such a bargain for a beautiful dress :).